← Tables and Files – What’s the Connection? Excellent article. I too am starting to play around with PowerShell and it is indeed a very powerful tool . .I look forward to learning more! This is the only script I have found on the internet that actually works. It’s my first adventure with PowerShell and you made it easy. Have you found a way to exclude all the views that exist in the “System Views” folder? Thanks, Tom, this is exactly what I needed. Looking around, there are a few articles on how to do this, but yours is the simplest and clearest. Just one thing I got from another article – be sure to exclude system objects or you get a lot of (probably) unwanted objects! This is a good article. 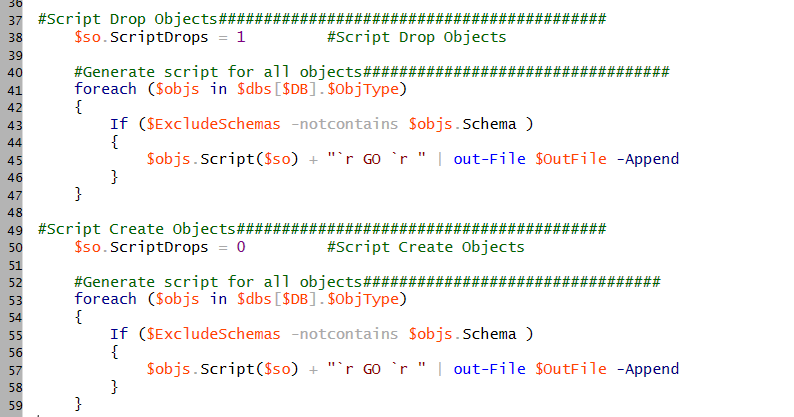 I recently wrote a script that will do basically the same thing, except for every database on a server. The problem I’m running into is how to script database objects on a SQL Server on the network, but not on the local machine from where the PowerShell script is being ran. Any thoughts?